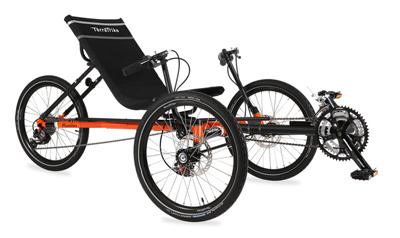 The TerraTrike All-Terrain is a purpose-built off-road tadpole trike for three-wheeled adventure, with a sensible range of gears and weight distribution. Before the All-Terrain there was the TerraTrike Rambler, the paradigm for the all-purpose, easy riding trike. Then they came up with the idea of pulling big knobby tires on it to make an off-road trike, and they called that the Rambler All-Road. The All-Road is nice, and we can sell you one, but it is a kludge, with the jack-of-all-trades Rambler working as a forest ranger. So TerraTrike hunkered down and worked out the kinks, and out came the All-Terrain. The one real difference in the frame between the All-Terrain and the Rambler is how the seat mounts. The Rambler’s seat slides on the frame for a wide range of adjustment, but it isn’t as firmly fixed to the frame. The All-Terrain’s seat mounts like it does on the new Sportsters… more firmly, with less adjustment, but greater rigidity. The rider is the most massive part of the trike and they are perched up high. As the frame clatters around over rough ground, the stress at the seat mount leads to a softer feel in the frame. When you start getting frisky out in the dirt, you’ll appreciate that stouter seat mount. Having done some triking in the rough, we know that a problem they have is rear wheel traction. Indeed, you’ll notice that tadpole trikes like this usually don’t bother putting a brake on the rear wheel, since it would mostly skid. Off-road, on a sudden sharp climb on soft ground, trikes can lose traction and bog down. By fixing the seat in a more rearward position the All-Terrain addresses this. 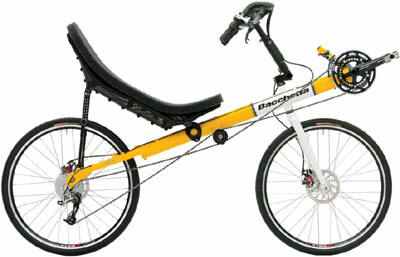 Shorter crank arms, a common trike upgrade, would also benefit some riders by letting them adjust the seat farther back. The All-Terrain also comes with a modern set of mountain bike components, wider ranging, ready for high-torque pedaling. It is seriously under-geared, for stump-puller gear ratios to climb up over tree roots and out of sand and mud. The brakes are top notch. The upgraded seat mesh standard on the Sportster is also standard. The All-Terrain does not have suspension, so you’ll feel those bumps. But then suspension adds a lot to the price. 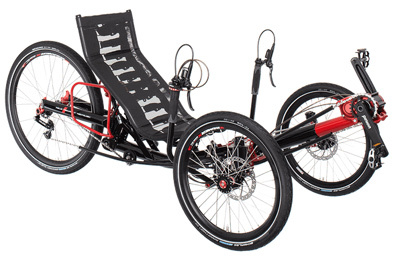 If you are looking for a trike to cruise around your state park trails and you like the price range that TerraTrike is strongest in, this is the tool for the job. We will take this opportunity to point out some concerns about large front wheels on trikes. First of all, like any high-sitting casual trike, there is a greater chance of rolling it over the higher you make the seat. This is not for carving fast turns. 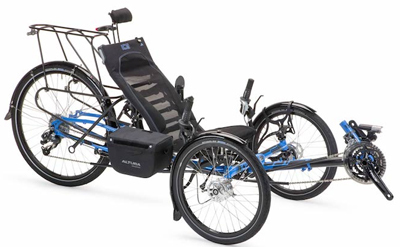 Trikes also follow the irregularities of terrain differently from bikes, and you may need to actively move your upper body to keep enough mass between the wheels. 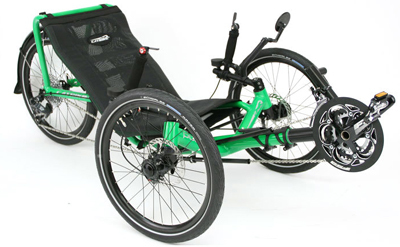 Also, trike front wheels take a lot of sideways force that a leaning bicycle wheels don’t. The double-walled rims on the All Road wheels helps here, but you run a higher risk of “taco-ing” a wheel with this design. It isn’t like we’re seeing an epidemic of problems, but you need to know the scope of possibilities and ride accordingly. TT’s highly versatile seat, especially good for upright seat positions. TT hasn’t shared this info and I’m too busy typing to go and measure it. You have a range of 10 speeds on the rear derailer. Depending on where you set your front derailer you’ll either have a closely-spaced set of 10 covering your lower range for climbs, headwinds, or when you are tired, or 10 widely spaced gears extending higher, for downhills, tailwinds, or lost weekends on amphetamines. This is a low range of gears, perfect for off road, but you’ll start to outrun your gears on road. 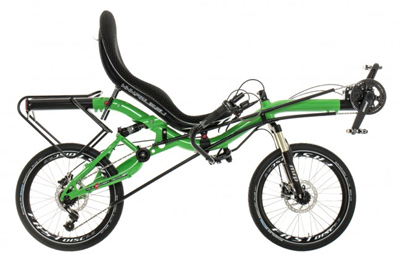 As a high-sitting trike you aren’t looking to go crazy fast on this. Comfort Straps are stirrups that hold your heel, mounted on a studded off-road bike pedal. You will want some sort of foot retention on a trike. This is a cool set of levers with a parking brake built in. They come as a set so you can lock both your front wheel brakes. Double wall rims are stronger than single wall.